COSTA RICA–A Belizean national who was busted with 6.5 kilos of cocaine in Costa Rica is now in police custody after he reportedly tried to depart the country with the stash of drugs hidden inside 284 pilot markers. According to La Nacion newspaper, the incident occurred at around 8:00 this past Sunday night at the Juan Santamaría International Airport in Costa Rica when a 37-year-old man, known only by his surname, Tillett, was busted by Drug Control Police when the officers asked to him open his hand luggage. 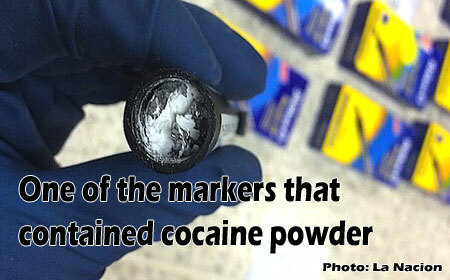 Upon inspecting the luggage, Costa Rican authorities discovered 29 boxes of pilot brand markers which contained 290 individual markers – 284 of which were found to be filled with cocaine. Tillett, who had entered Costa Rica on a flight from Bogotá, Colombia, and was headed to Guatemala City, was immediately arrested, and apart from the 6.501 grams of cocaine confiscated, authorities also took hold of US$91 in cash that he was carrying. According to La Nacion, this is the third time in less than three weeks that there has been an attempt to export cocaine in pilot markers through that terminal in Costa Rica. The first case reportedly occurred on August 10 when the Drug Control Police discovered that a 40-year-old Colombian woman with the last name “Marin” was heading to Guatemala with 7 kilos of cocaine hidden inside 10 boxes of markers. Two days later, on August 12, police also confiscated 1,030 grams of cocaine which was detected by a Labrador dog inside 93 tubes of mascara. So far this year, reports indicate that Costa Rican National Security authorities have intercepted 15,675 kilograms of cocaine, 50,333 doses of crack, and 2.9 tons of marijuana.